I am a relative newcomer to the AK variant world. Sure, I fired one once or twice while I was in the military, and my dad has had a MAK-90 for 20 years, but I never had the Kalashnikov itch. One day, however, I walked into my LGS and found the most beautiful/ugly thing I had ever seen. It was a WASR-10, which someone had lovingly uglified: it had a Galil style handguard, a Tapco commercial AR style collapsible stock and an AMD muzzle brake (fortunately a Tapco original style AKM muzzle device came with it). I was given an offer I couldn’t refuse and immediately snapped it up. But what do I do with it? Can I make this descendant of Mr. Kalashnikov’s AK-47 something that I, a dedicated AR guy, can live with, something that I would want to take out in public, something to show off to friends? So began my improvement process and the first major transformation, the installation of Iron Hammer Armory’s M4 Low Profile AK47 Hammer Trunnion. I contacted Iron hammer Armory after scouring the web for stock options and finding that everything either was an AK style stock that mated to the original trunnion or used some sort of adapter to install an AR style collapsible stock; no bueno as far as I am concerned. After breaking a stock adapter off at the trunnion while doing some training, Martin set out to develop an option for those desiring an AR style collapsible stock for AK variants that would be near indestructible. 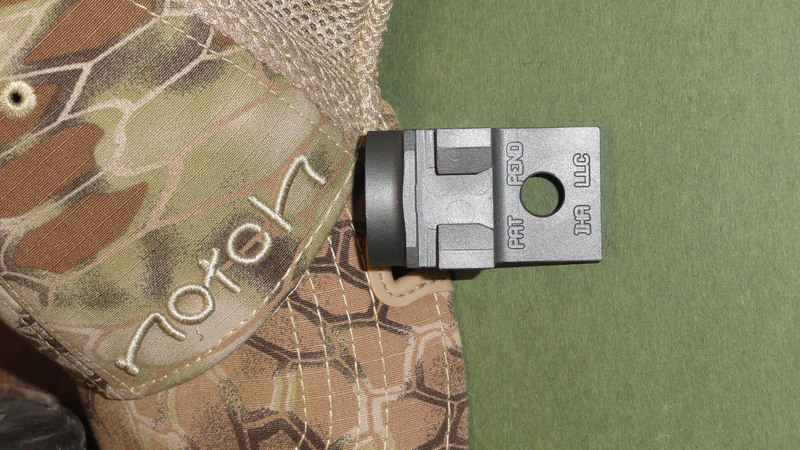 First off, the M4 Low Profile AK47 Hammer Trunnion is not just another adapter; it replaces the rear trunnion on your AK variant with a near half-pound block of 4140 steel. 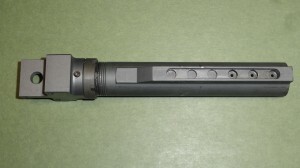 The Hammer Trunnion accepts mil-spec AR carbine buffer tubes, enabling you to install any mil-spec collapsible stock on your AK variant; you can put a Magpul on your Maadi, a Mako on your MAK-90, ERGO on your Bulgy, or since I am out of clever matches, any mil-spec buffer tube/collapsible stock combination (including PSL). 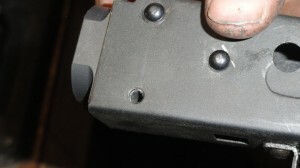 It mounts using three 4.5mm rivets, two in holes in the traditional placing and a third about an inch below the rear rivet. The buffer tube is screwed into the trunnion and locked with a standard castle nut then a set screw is screwed into the keyway to center the buffer tube and prevent it working lose. 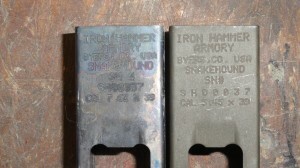 The Hammer Trunnion is made in-house by Iron Hammer Armory in Byers, Colorado. Each one is milled from 4140 ordnance steel, then heat-treated and hardened to a Rockwell hardness of 58-59 and Duracoated. Being US made it is also 922R compliant, so if you are building or converting a rifle the Hammer Trunnion is the way to go. 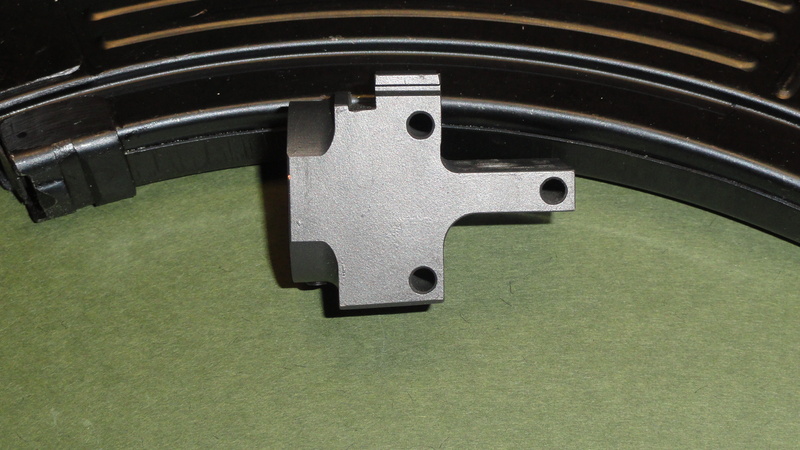 Also, unlike most stocks or adapters which angle downward from the rear of the receiver, the Hammer Trunnion has a slight upward angle. 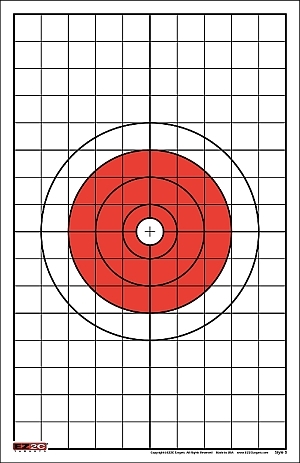 This achieves bore axis/buttstock alignment, aiding in recoil management and maintaining proper eye relief with either iron sights or a low profile optic. 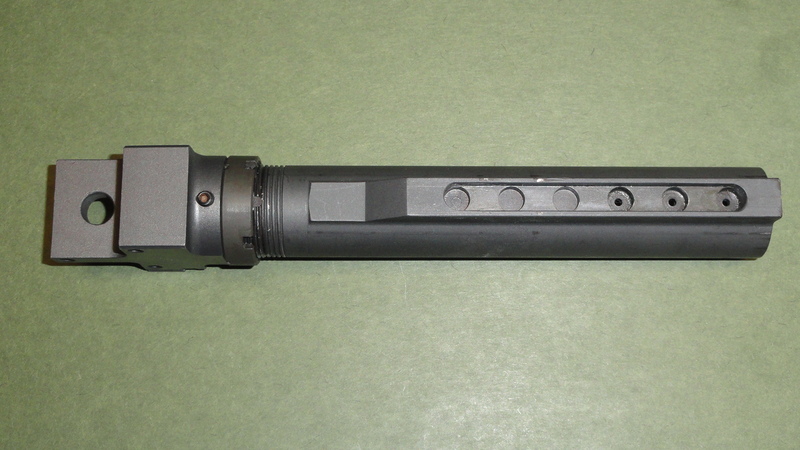 In comparison, when fully extended the Hammer Trunnion elevates the rear of the stock by nearly an inch over the former Tapco adapter. Currently, the Hammer Trunnion is only available in the M4 Low Profile version, but according to Martin, other models are in the works, including a high profile model for higher mounted optics as well as other AK variants such as Yugoslavian, and commercial variants like Saiga. There are also a couple of other things in the works at Iron Hammer, but they are hush-hush for now and I am hoping for some exclusive opportunities. I spent a few hours recently with Martin, the owner of Iron Hammer, for the install of the Hammer Trunnion on my WASR-10. Just the removal of the Tapco stock and adapter was enough to make me giddy as a schoolgirl; when firing it was akin to scraping my face with a broken brick. 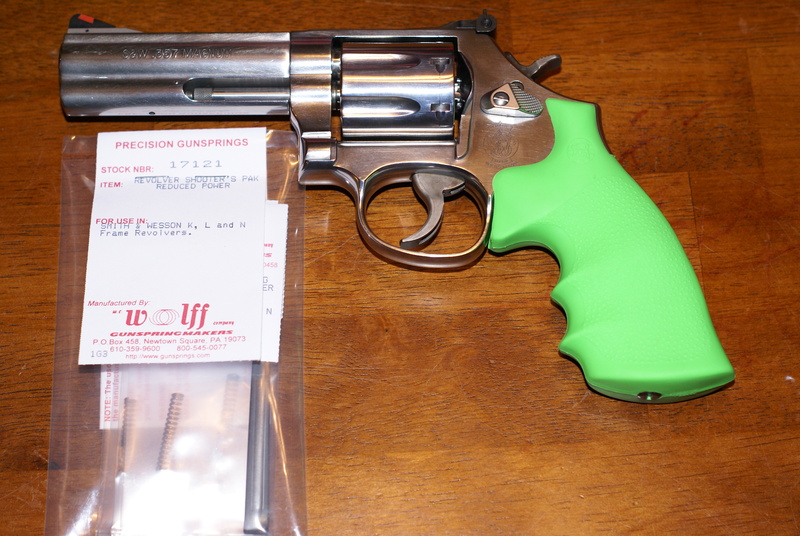 The adapter was also commercial sized, so I could not fit one of my mil-spec stocks on it. Since I currently lack the experience with AKs and the tools to accomplish the work I was able to take my WASR to the Iron Hammer shop to be outfitted. Martin took one look at my rifle and claimed it to be the ugliest thing he had ever seen and an abomination to AK-dome (not really, but it is a work in progress). With the hand and eye of a true expert he drilled out the rivets, drilled the new trunnion holes and installed my Hammer Trunnion. When seating the rivets he flattened them rather than leaving a round finish, which I think gives them a more finished look. Since the Iron Hammer name is on the work he also wanted to polish up and refinished the shiney spots, but I denied him the opportunity-it is an AK, and I appreciate an ugly rifle-so the appearance is not a reflection of Iron Hammer workmanship but rather my own doing. Do any of you readers want a rifle from Snake Hound Machine? In conversation I mentioned that I had asked the quite popular Snake Hound Machine for a quote on a rifle build. What did Martin do? He showed me some receivers, the ones he makes for Snake Hound. Iron Hammer not only makes the receivers, they make the entire rifle minus furniture. Yes, Snake Hound uses the finest parts, an Iron Hammer rifle sans furniture, for one of their “custom builds.” Sadly, Iron Hammer will be decreasing production sharply in 2014, putting together only 40 rifles this year, however, this is better than them leaving the rifle manufacturing business altogether. 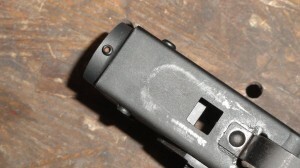 In case anyone was counting, there are three reasons to have a Hammer Trunnion on your AK. Number one, Iron Hammer Armory is a small business offering a platform enhancing product. 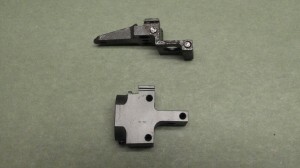 Number two, they are made in the USA and count as a 922R compliant part. Number three is that it is just a frikkin’ awesome addition to the AK; I think this trunnion is a game changer. The Hammer Trunnion is available for $134.95 at ironhammerarmory.com. 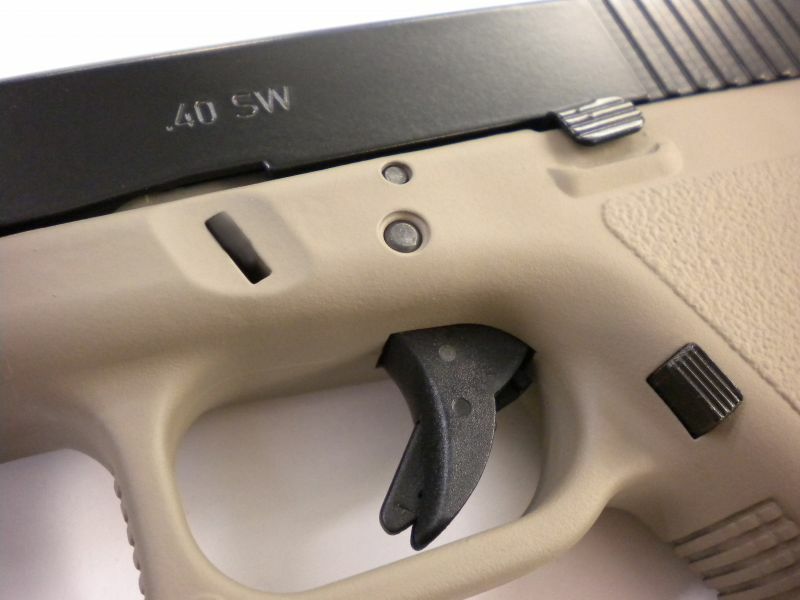 You have the option of just ordering the piece or you can send your rifle to them to have it installed. Iron Hammer offers a couple of upgrade packages for your AK variant which include better part fitment and accurizing. They also have a program called Project Minion, in which local teens are brought into the shop and paid to learn the art of blacksmithing. Similar to an apprenticeship, the teens are paid to learn, and they sell their completed projects on the Iron Hammer website. 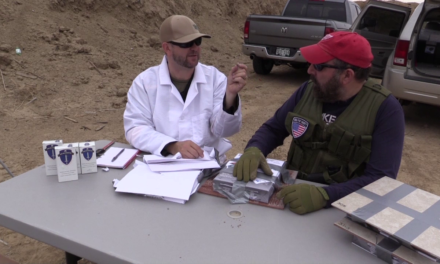 I greatly look forward to working with Martin and his crew again and showing our readers and listeners more game changing products from Iron Hammer Armory.